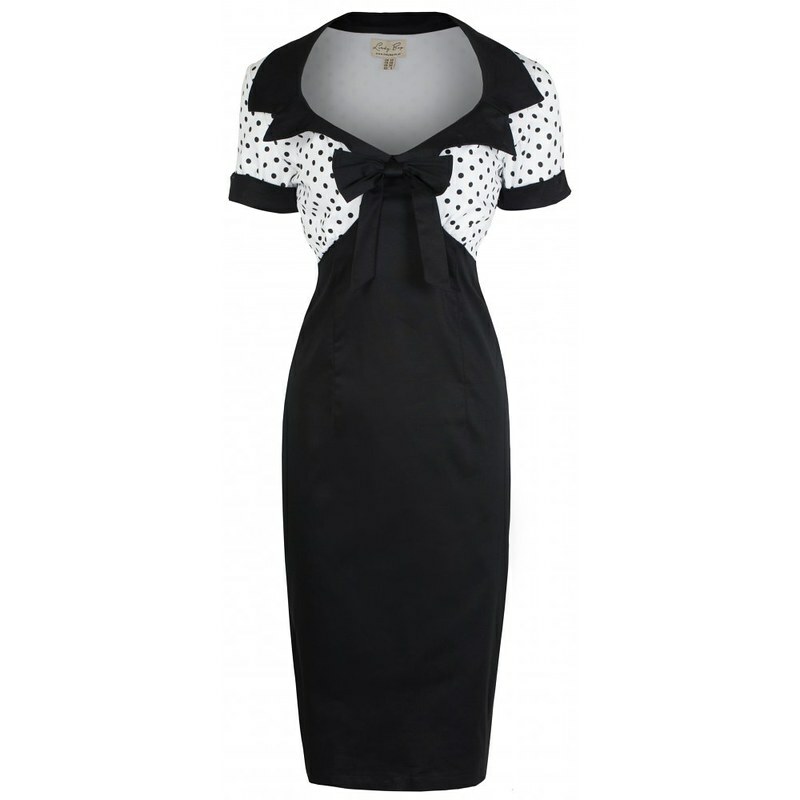 If you like vintage styles, no doubt you've been tempted by the brand Lindybop, which sells mainly online at very reasonable prices. If you've tried the brand, then you may have found that their sizing and fit is more hit and miss than with some other vintage style brands. I'd like to share with you my experiences of their dresses, with notes on sizing and fit, and hope that this helps you when you're making your future shopping decisions. A lot of the dresses are based on the same general pattern as earlier ones, so once you understand the size and fit of a few styles, you should be able to judge much better how other dresses in the range will fit. Bear in mind for all of these sizing and fitting notes that I am a UK size 12 generally, 38-29-39 approx, and 5'9" tall. I find that a style that is fitted on the waist, or 'shift' styles are most flattering on me. 'Empire' styles are not that great on me, they end up looking a bit like maternity wear. 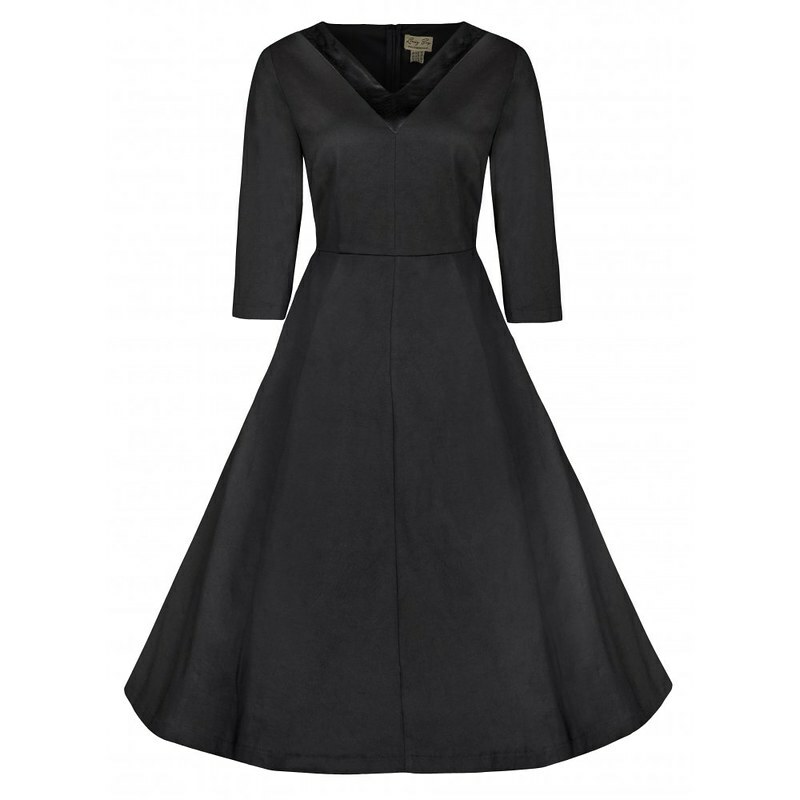 My most recent Lindybop purchase, I bought this the other week in the size 12 and sent it straight back because the fit was bad on me. It actually covered my knees though, which was good! Excess fabric around tummy area, most unflattering. Fabric seemed a bit cheap. Little bit tight on the derriere and hips. Length good on me (below knee). 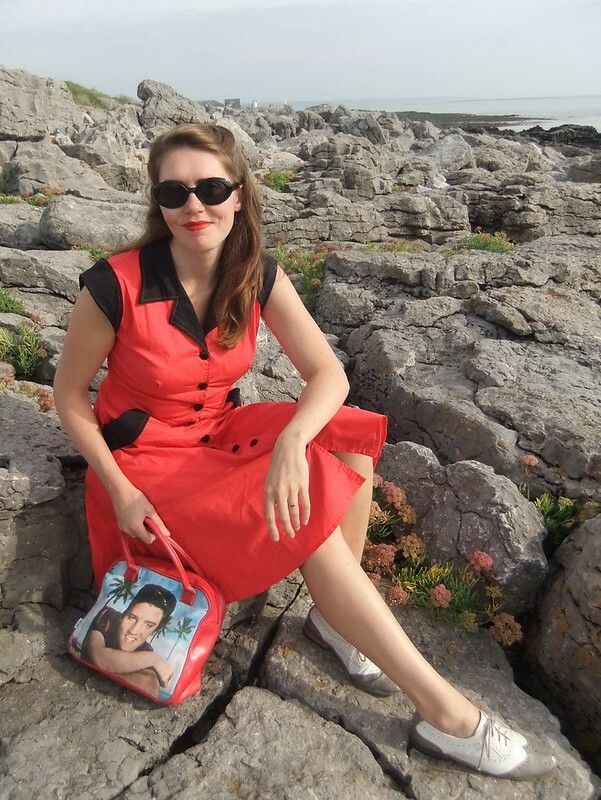 My favourite Lindybop dress, which I received as a gift. I have the size 12. 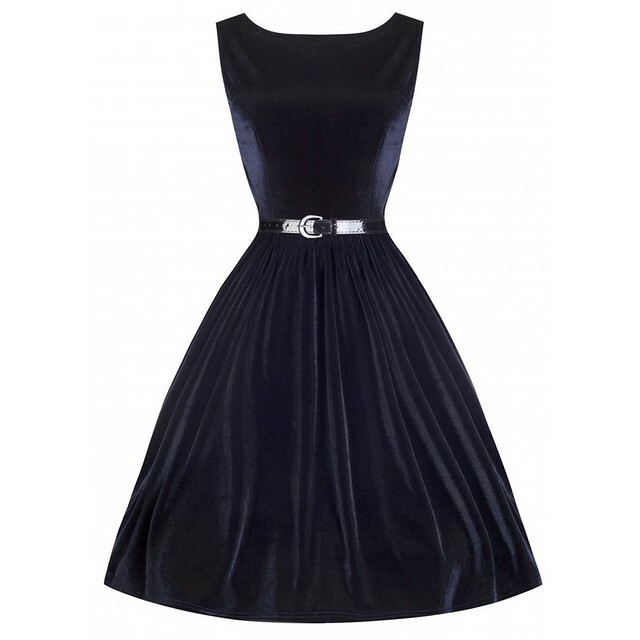 It's described on the website as a 1950s wiggle dress, but it's more of a 1960s shift on me. Gorgeous soft fabric, drapes and washes well, good quality. Super fit, though more as a 'shift' than a 'wiggle'. Not long enough on my tall frame to be 1950s inspired, it's more 1960s. This dress was a gift, in a size 12, and I struggled with styling it for a while until I removed the bow and attached a pin to it, so now I wear it more to work without the bow as it feels less fussy that way. You can see more pictures of where I wore the dress previously here and here. Fabric feels a little on the cheap side. Good fit, though slightly loose on the waist. The red version is currently on sale for just £22.99. Just above knee on me. Another dress that I bought and sent straight back. I tried the size 14. The fit on this one was awful, really tight on the shoulders and bust (I couldn't have even got in to the size 12! 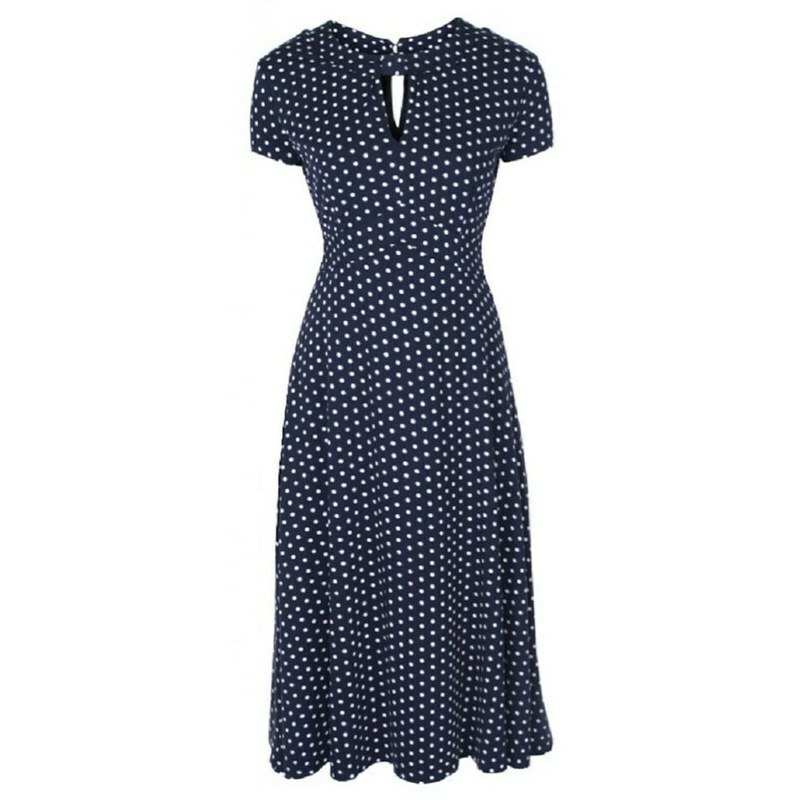 ), and having much more of an empire line and therefore not looking much like a '40s dress as described on the website. Nice weight fabric, quite 'swingy'. Button had come off and was frayed. This was another gift. I love this dress and have the size 14 which fits perfectly. 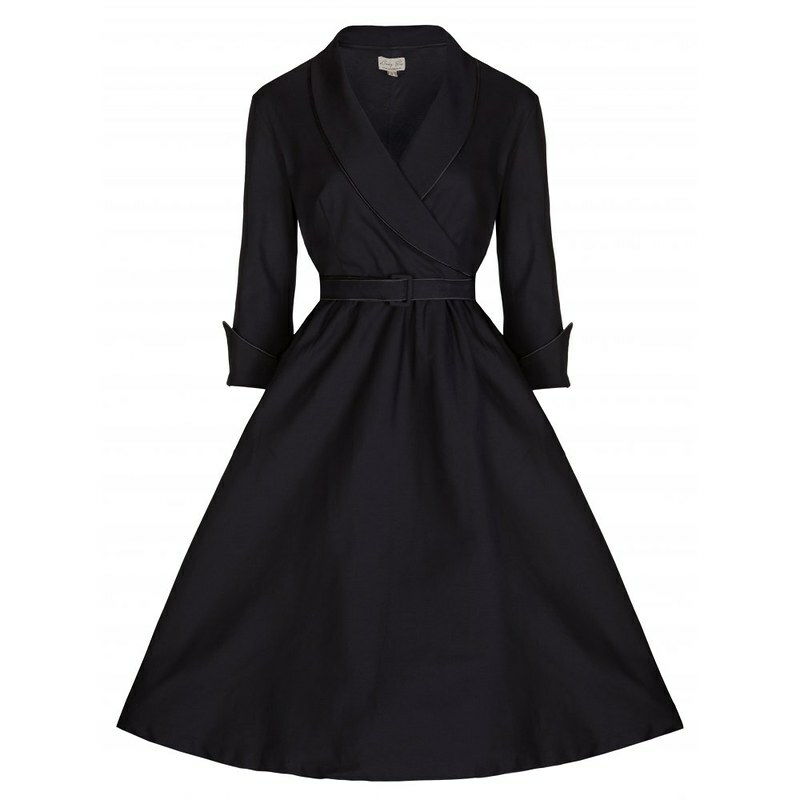 From the heart-shaped buttons to the pockets, this dress ticks all the boxes for me. Slight stretch to the cotton fabric. Lovely detail - buttons, pockets etc. Runs small, you'll want to size up. This dress is only available in leopard print trim now rather than the black. This was another gift. I don't wear it very often as it doesn't have sleeves, and the shawl collar makes it awkward to fit a cardigan over the top. I had to go for a size 14 in this style. The fabric is quite thick and reasonable quality. Fabric too thick for a sleeveless dress. Out of stock on the Lindybop website now. Hits just below the knee on me. This dress was such a disappointment as it looks gorgeous online, sort of like a much cheaper version of the Eliza J range at House of Fraser, but the fit was awful. I tried a size 12 and couldn't even zip it up. It looks as though this dress should be fitted on the waist, but the waist was up high under the bust, so a more Empire line. Waist too high on me. Hits below knee on me. There was a world of difference in the fit between this dress and the Vivi. I tried a size 12 and it was too big, and quite frankly a bit shapeless and frumpy. Lovely satin trim at neckline. It's in the sale for £26.99. Another odd one this, with a fit that's quite different to how it's pictured. It's slightly Empire line, with a very snug fit on the top half, and then a weird fit on the bottom that has no 'wiggle' even though it's in the wiggle dress section on the website. It's more of an A-line fit to be honest. You can see more pictures of me in this dress here. I have the size 12. Too short on me, is above knee. I ordered this dress as a replacement for some of the other dresses that didn't fit, and found this dress had even more issues! Firstly, the hem was wonky. A good inch shorter on one side than the other. The other issue was the frump factor. It just looked a bit dowdy. The fabric just hangs there in a bit of a shapeless way. Finally, the belt they sent with it was a cheap looking patent one, in black rather than the navy of the dress, and it just didn't look right. I tried the size 12. Below knee length on me. The belt included isn't a good match. 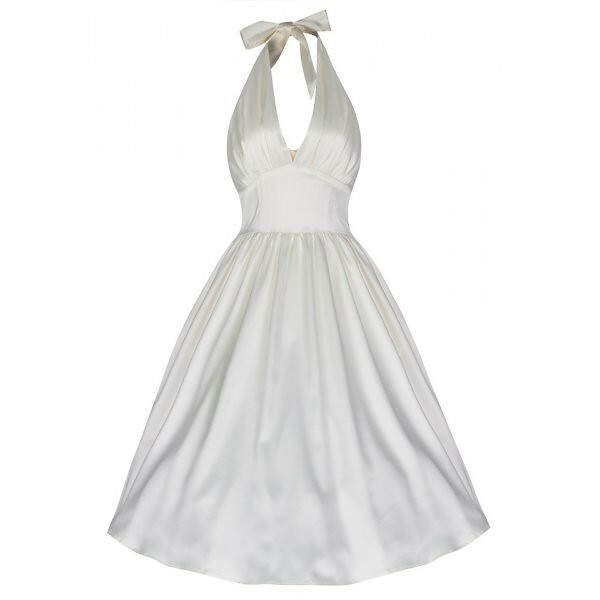 This dress looks stunning on the website and a few notches above the standard fancy-dress Marilyn type dresses you get. Alas, in person the dress is made of a shiny fabric that looks cheap and a lot more yellowish than pictured. It's lined, so isn't seethrough like a lot of the cheapo Marilyn dresses, and there are some pads in the bust area to help things along there, but I still found the fit a bit baggy on top for my small bust. Excellent fit on the waist though, in the size 12 I tried. Back it went. Perhaps a bit big on top for smaller busts. Fabric looks a bit cheap. 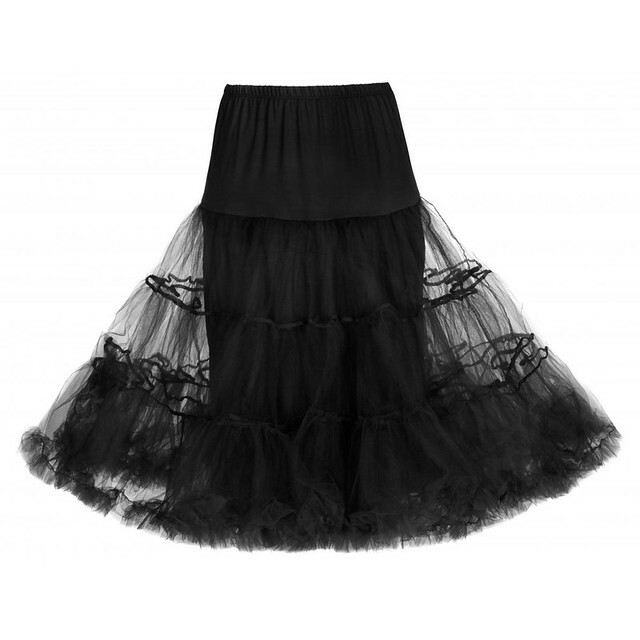 Finally, I have a petticoat from Lindybop. It's made from organza, which I find really scratchy against my skin, it's really quite uncomfortable. I also find it rides up and gets full of static, so I wouldn't buy one of these again, in fact I want to replace this one with a chiffon petticoat. Attracts static, rides up a lot. Good price (much cheaper than most petticoats). Just to recap then, if you're ordering from Lindybop then check your measurements carefully against the size guide for each item, as there's a lot of variation in sizing. You'll also find a lot of variation in fit, and it might be trial and error until you find a dress that fits. If you're ordering for a particular event or occasion I'd suggest you order more than one so that you can try a few on. I've found their customer service to always be excellent - the staff are very friendly and helpful if you ring them, and I've found the refunds and exchanges to be pretty smooth. 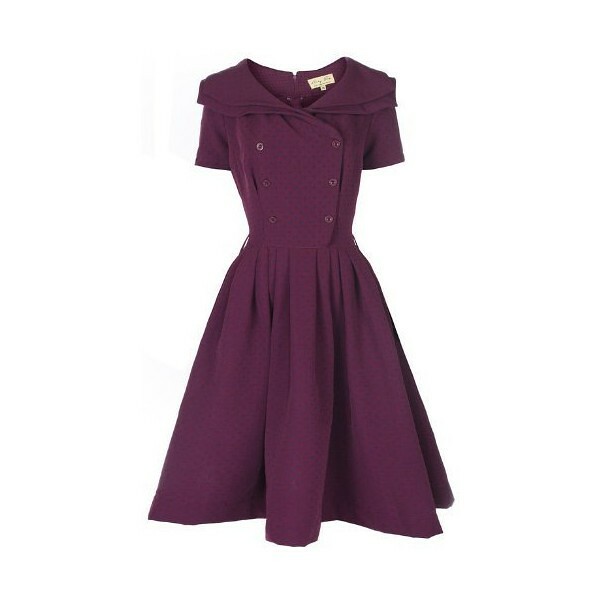 If you're looking for a dress that is now out of stock on the Lindybop website, don't forget to check Ebay or Amazon, or independent stockists such as Emily Rose Vintage or other boutiques in your local area. Have you tried Lindybop? How have you got on with their fit and sizing? Thanks for that - it's always useful to know how a brand's sizing runs. 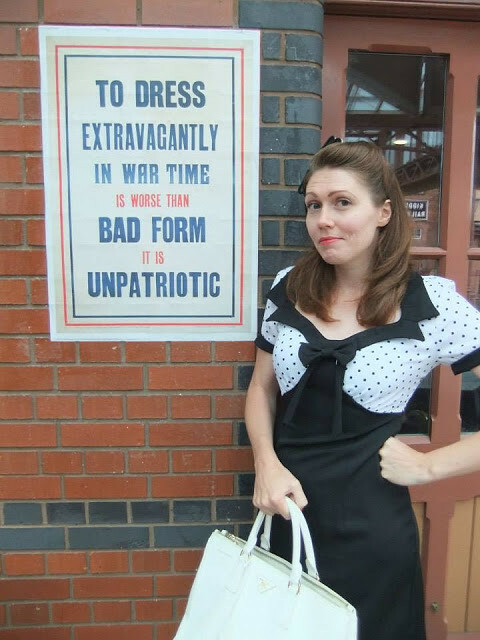 I've heard varying things about Lindybop - I suspect that, like Collectif (I won a couple of dresses by them), quality and fit can vary greatly from style to style. This post is really useful, thank you <3. 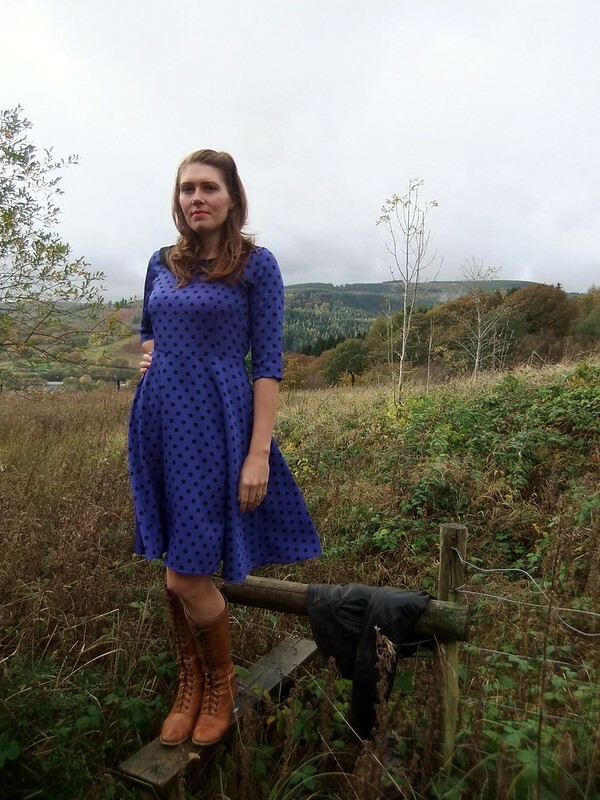 I've only got two LindyBop dresses; the Lana and the Ophelia and both are fine in my usual size. Your choice of dresses (and the ones you're so lucky to own) is amazing. There are some great, great pieces of outfit there. I like the way they hug the curves, and the color & pattern of them. I've heard such bad things about their sizing I've never taken the risk. Wow, what a thorough, fantastic post. I really appreciate you penning this as my own fit experiences with this brand have mixed to say the least. This past Christmas, as my main gift from Tony, I ordered my first (and to date, only) four dresses from Lindy Bop. Foolishly and completely unintentionally, I didn't try them on at the time, in fact, I didn't try them on until just a couple of weeks ago. Turns out that one is much too small (despite be ordering the supposedly correct size based on the measurements on their site) and I'm going to have to sell it, as I'd need to lose a lot of weight to get into it comfortably and I highly doubt that's going to happen, and the other three are borderline too big, but I feel like I need to see them on camera (aka, in photos) to judge their fit properly. There's a chance I may need to sell them as well. We'll see - oh, and of course, Murphy's Law, the dress that's leagues too small was my favourite of the four. I'm certainly not giving up on this brand though (and the shipping costs to send that one dress back would have been nearly as much as it cost, so I would have had to have sold it whether I found out about the fit in January or this month), I may try items other than dresses, like skirts and crinolines next from them. Again, fabulous post and sizing insights. Thank you so much! I love LindyBop dresses. Had to take back one dress I ordered and exchange it for a bigger size, I'm generally a size 10-12. 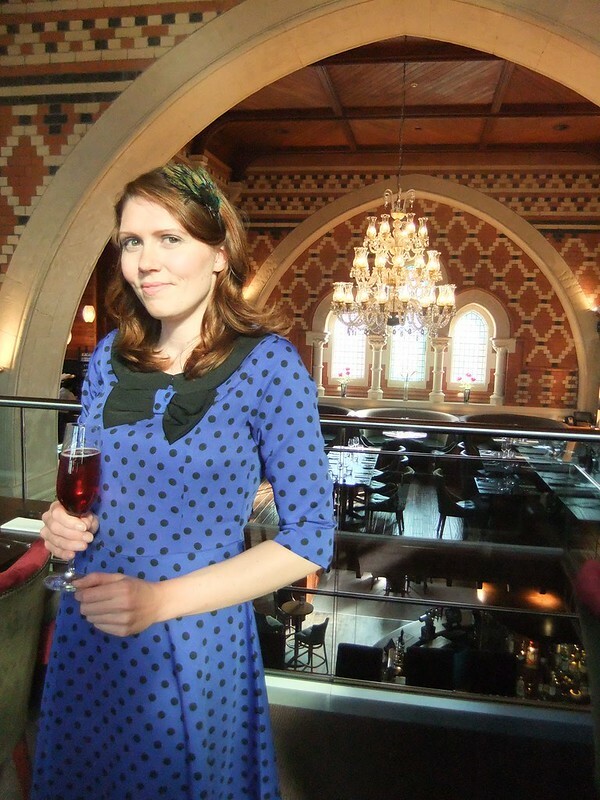 Always get compliments when I'm out wearing LindyBop.